Unfortunately – it was Paradise. 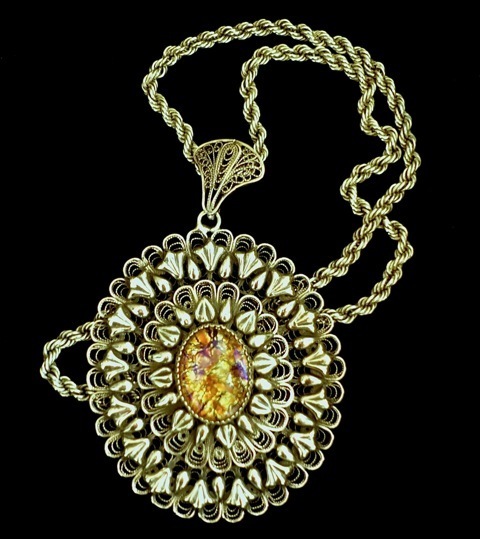 Walking over the ancient stone cobbles of the Muslim quarter of the old city of Jerusalem in May 2016, and holding in my hand, the diary my Mother wrote 55 years ago when she too visited the city, and wearing the large silver filigree pendant my Father bought for my Mother in 1961 from one of the bazaar sellers, I was suddenly overwhelmed by flash backs from my childhood that was spent in the Middle East (Kuwait and Abu Dhabi) and I began to sense the enormous task I am undertaking on behalf of an a-n Travel Award and an Arts Council England Artists International Development Award, and with the generous additional support from British Council Palestine, the Palestine Paralympic Committee and Kvinna til Kvinna. 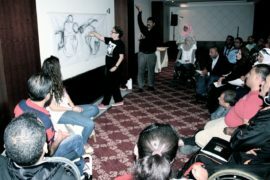 Now in Palestine, my mission was to develop cultural relationships to enable me to contribute to the social change through artistic engagement, and to build cross-cultural relationships with my collaborators and artistic partners in UK, with the intention of ultimately developing a large artistic project. The first few days of the research trip focused on my personal artistic work, and gave me the opportunity to explore the Old City of Jerusalem, and through psychogeographic meanders through the city, I was able to learn and understand more about the history and culture of the ancient city and the significant 1947 partition plan, and to witness how religious groups now occupied the city and how the partition had ultimately divided both the land and the people. Meetings were organized with many artists, gallery directors and NGO officers, all working in the region to support the disparities that have manifested since partition occurred in 1948. As part of this R&D I was able to initiate a series of workshops gatherings in collaboration with Field Officer Magnea Marinosdottir from Kvinna till Kvinna, British Council (Occupied Territories ) and with the Palestinian Paralympic Committee. 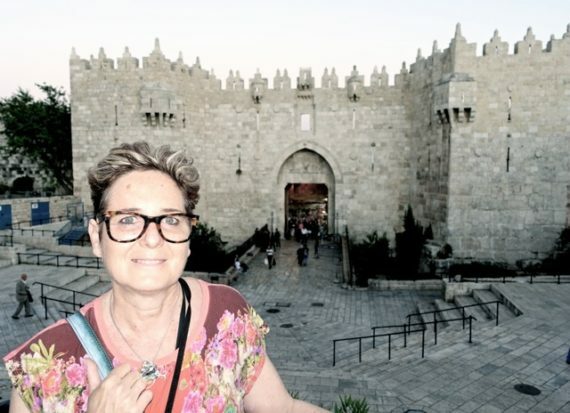 I therefore had the chance to collaborate with many disabled artists and athletes, and also the Bereaved to Bereaved Women’s Group of Jerusalem. The workshops enabled me to meet with over 100 individuals to build the foundations for a proposed sustained artistic collaboration in the future. The Bereaved Womens group is supported by the Women’s Studies Centre and Kvinna till Kvinna Foundation. These workshops were particularly intense, emotional and at times harrowing in narrative content, but somehow out of the human struggle of these women’s experience, powered articulations became sensitive drawings that transmitted the real depths of their current suffering. Through my artistic practice I explore notions of being human; I am particularly motivated by perceptions of fragility, survival and hope experienced by vulnerable individuals and communities across the Globe. As an artist I am both disabled and visually impaired and I am drawn to cross cultural projects that collaborate with individuals that may not necessarily have a voice that is heard within society. The nature of the conflict in the region meant that these are desperate narratives that were being related but through the process of making art, and through creativity laughter could be heard, for a moment, once again amongst everyone I met and collaborated with. 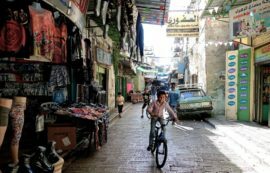 The bursary opportunity enabled me to not only meet many artists and collaborators in the West Bank region but also build strong relationships and foundations for the creation of a sustained UK/West Bank future artistic collaboration. There was also the opportunity to meet with key ministries, decision makers and NGOs who share the motivation to find meaningful ways to empower disabled people across the region through the arts, these included Palestine Red Crescent Society, Stars of Hope, the Higher National Committee for Persons with Disability Card, Ministry of Culture, Ministry of Social Affairs, Bethlehem Arab Society for Rehabilitation, Al-Basmah Rehabilitation Centre, Art Court Al-Hoash, START-Bethlehem, Women Studies Centre and Kvinna till Kvinna, Al-Ruwwad Cultural Centre at Aida Refugee Camp and the Palestinian Paralympics Committee, the onward vision is supported and collective. My work is ultimately cross cultural and when I returned from Palestine I has met with Prof Annie Coombe of Birkbeck University, The Creative Industries Heads of Departments at London South Bank University, where I was recently awarded an Honorary Doctor of the University, the Directors of Liverpool Arab Arts Festival and also the Director of the Milton Keynes Islamic Art Festival, with the intent to build the cross cultural UK element of my vision. 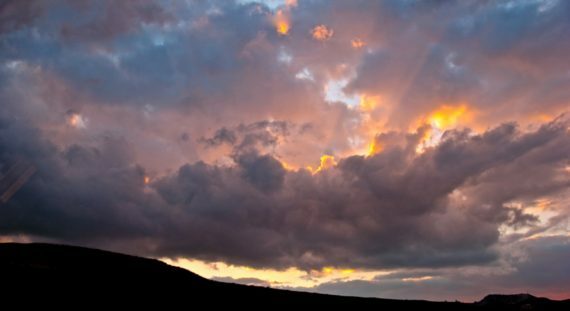 Each of the UK partners will be supporting partners for the creation of a sustainable collaboration. I will always be grateful to the funders for supporting this truly incredible journey and for this memorable creative experience to happen. 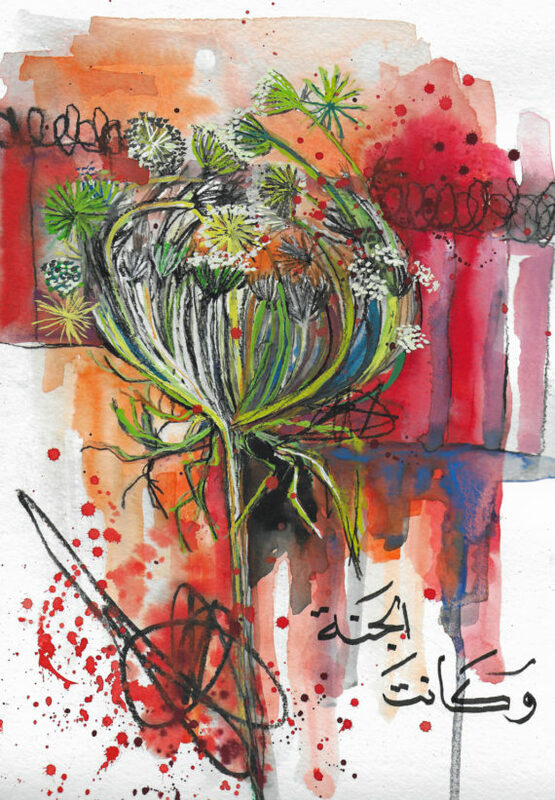 British Council Palestine (Occupied Territories) invited Gadsden to return to Palestine in January 2017 to co host an exhibition of all the work that was created during the R&D trip with her Palestinian collaborators. 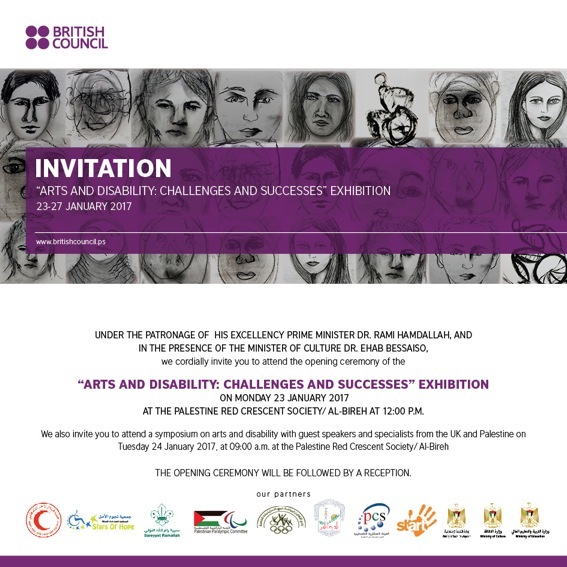 The Exhibition supported by the Prime Minister of Palestine and opened by the Minister of Culture was accompanied by a Symposium – “Disability & Arts: Challenges and Successes” 23-27 January 2017. Gadsden presented at the opening reception and at the Symposium and lead a series of workshop sessions. 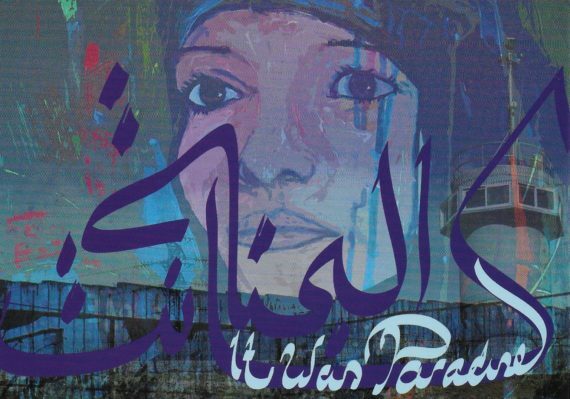 It was with huge excitement, in March 2017 Gadsden was awarded an Unlimited International R&D Commission for It was Paradise – London – West Bank – Liverpool and Gaza. 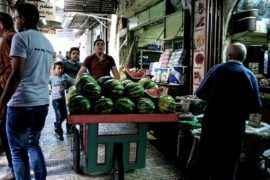 In 2018 I was thrilled to receive an award to travel to Jordan from the Roberto Cimetta Fund, to artistically collaborate with Iraqi and Syrian refugees, with Ethnographer Dr Yafa Shanneik, Palestinian artist Amna Ali Hussein and composer Freddie Meyers. I am most grateful for the wonderful support I received from Director Dr Carol Palmer and all the team at CBRL Amman. When I applied to the Cimetta Travel Fund, over a year ago, I had absolutely no idea, at that point, just how significant the travel award would ultimately be, with regards to the research I was able to undertake for my art practice during the residency, but also the extraordinary imaginative engagement and collaboration that emerged with the Syrian and Iraqi refugee women in the region. 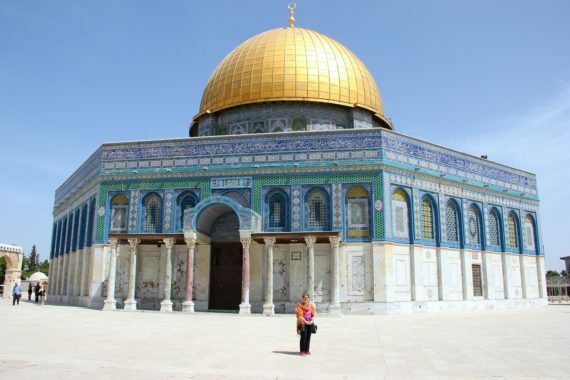 The most significant element was the development and substantial outcomes that have ultimately occurred over the last 8 months, which have greatly contributed, in many ways, to bringing emotional and cultural change to the communities and audiences we engaged with in Jordan, and more recently in Saudi Arabia, UK and beyond. Roberto Cimetta Travel Fund really was a significant critical catalyst for the project, and with the British Academy and CBRL (the Council for Research in the Levant) fund awarded to Dr Shanneik, and with additional incredible key support from Dr Carol Palmer and her wonderful team from Council for British Research in the Levant, in Amman and local partners including the Jordanian NGO, Khawla Bint Al-Azwar Society for Women Empowerment, we were able to expand and deliver a far more engaging project with the refugee women that we collaborated with. 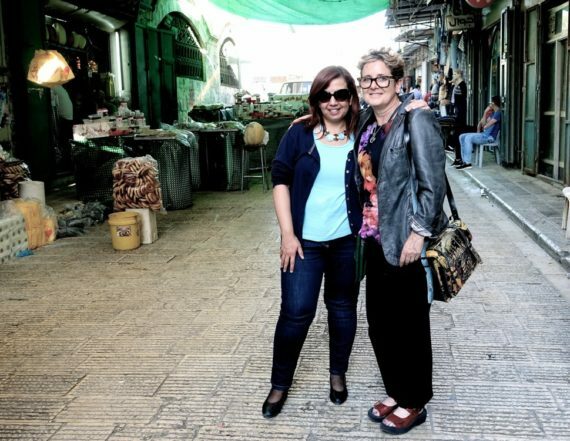 Throughout the trip Dr Carol Palmer, Director, and her team at the Council for British Research in the Levant – CBRL, Amman http://cbrl.ac.uk/british-Institute-amman hosted my work and me, facilitating accommodation and also a wonderful art studio. Being based at CBRL gave me the opportunity to meet and engage with many local and International academics, archaeologists and researchers who visited the centre throughout my stay to undertake their research. Under the guidance of Dr Carol Palmer, the interaction with such experts was both invigorating and very stimulating too. 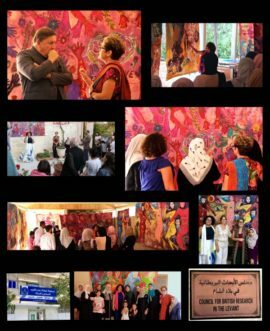 CBRL also presented one of the resulting exhibitions of the artworks created in collaboration with the Syrian and Iraqi women refugees and the “All at Sea” art and music performance, that I created during the residency with British composer Freddie Meyers https://www.freddiemeyers.com. The CBRL building became the most perfect gallery and performance theatre for the project. 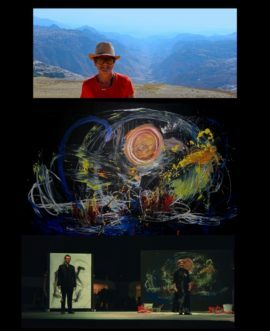 Expressionist in artistic approach, I create both solo and collaborative art commissions and projects nationally and internationally through, painting, performance, digital film animation, dance and music, with the object of developing cross-cultural dialogues considering universal notions of humanity. As a disabled and visually impaired visual and performance artist and director, I am motivated by the notion that every voice within a community should be heard, and consequently should play an active contributing part in the community. Over the last 10 years I have focused primarily on cross-cultural collaborations, engaging vulnerable individuals and communities in UK and beyond, to create and share art that expresses and celebrates identity, diversity and culture. Often located in places experiencing conflict and that may be socially and economically deprived, my artistic vision is to draw attention to pertinent political, cultural and social issues through art, compelled by narrative. The focused outcomes being primarily underpinned by the human traits of fragility, survival and most significantly hope. The nature of building exchanges, networking and international contacts is therefore absolutely fundamental to my art and practice, and contributes enormously to the constant development of my artistic vision and the cross-cultural projects that emerge. Recently I have focused on UK/Arab collaborations, engaging mainstream and vulnerable/disabled individuals and communities in UK & the Arab region, with the motivation to celebrating identity, culture and spirit. My work addresses issues of human rights, and notions of vulnerability, and by reaching out to fragile communities, voices can be heard that are, all too often, excluded from political and social platforms. 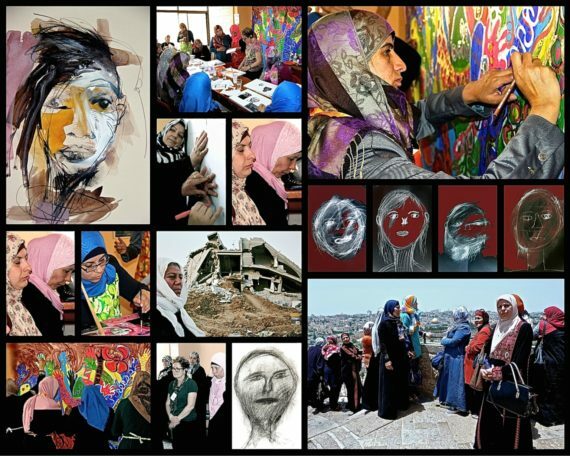 Artistic and scholarly collaboration enables a far broader context to both the subject and the objectives of the narrative, and the use of multiple art forms additionally facilitates artistic engagement that transcends nationality, age and religious and social barriers to stimulate and empower many across the Globe. Through artistic engagement, one of the main objectives of the project and research was to gain first hand knowledge and personal insights into the experiences of Syrian and Iraqi refugee women’s Migration journeys and to understand how the women were now negotiating their ‘politics of belonging’ through their shaping of social relations, their challenging of religious boundaries and how the women were now facilitating community belonging and integration within their new diaspora in Jordan. 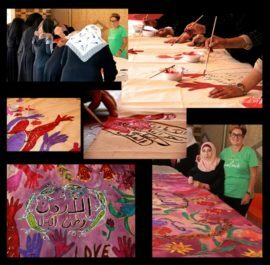 It was overwhelming at times during the workshops to hear the extremes difficulties and the situations that the women had to go through to flee the challenging circumstances of the war and conflict in their homelands. But it was also incredibly empowering to hear how the women had survived their utterly challenging circumstances and journeys, and to witness how they were now attempting to rebuild their lives. During the workshops the women absolutely embraced the process of creating art, and the activity of making art significantly lifted their spirits, and it was heartening to witness how the women all supported each other through the creative process. 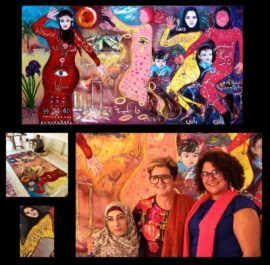 Many had never had the opportunity to be expressive through art before, and the process of using art as a universal language and creative tool, facilitated a deep level of engagement from all the women who participated. Some of the women could not read or write, but they certainly could paint and relished the opportunity to be able to share their stories through art. The interest and deeply moving responses that we received to the collaborative artworks, the stories collated by Dr Shanneik, and the performance during the exhibitions, gave us a real sense of just how important it is to share these diaspora stories through creative expression where the refugee women’s experiences are the catalyst for discussion, community engagement and research. 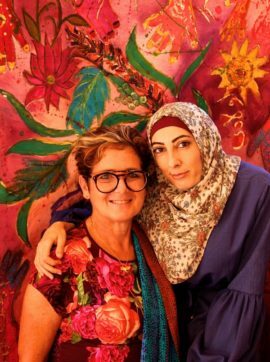 It was extremely important to be assisted by Amna Ali Hussein (Palestinian) throughout my residency and the delivery of the art workshops. Hussein supported simultaneous interpretation throughout, which enable a greater depth of conversation and emotional engagement for me with the women – I spent my formative years living the Middle East so to some degree I am very familiar with the culture of the region – but Hussein’s sensitive approach was invaluable throughout. Hussein, like myself is also a disabled artist, and we are motivated by similar philosophical concerns. The opportunity to gain such a deep understanding of the culture during the development of the artworks, beyond the community workshops, as we painted for approx10 days to complete the artworks, was incredible. Meyers (composer) and I additionally had the opportunity to travel to the main historical sites across Jordan, Petra, Kerak etc, and the opportunity to witness and experience, not only the refugee stories but also the historical context of the Jordanian culture and the land, ultimately gave us the inspiration to create “Ships of the Desert” a “live” art and music performance commissioned by Misk Art Festival 2018, Saudi Arabia. 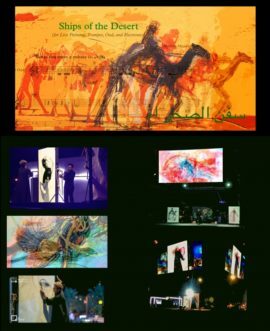 The performance focuses on both historical and contemporary desert migration, and is inspired by Gadsden’s recent artistic collaborations with refugees in Jordan, UK, and Germany, her artistic responses and research of the Nabateans Empire, and the ancient frankincense trade route of Arabia. 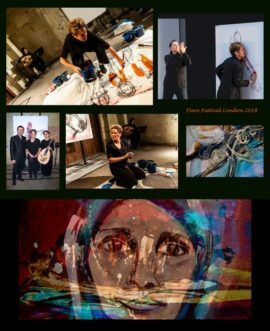 The desert trade journeys of the past are juxtaposed with contemporary migrations, expressed through the voices of the women, sounds, music and live dramatic expressionist art performance, to stimulate powerful evocative responses. 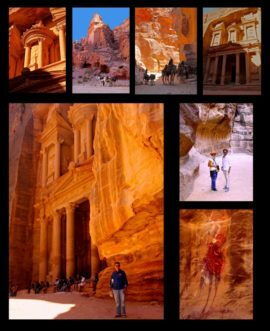 The performance portrays both the beauty and the challenges of present-day diaspora, to consider how individuals throughout history have undertaken demanding desert journeys and how these journeys influence our understanding of the rich heritage of Arabia. It was Paradise Unlimited Commission R&D Residency. 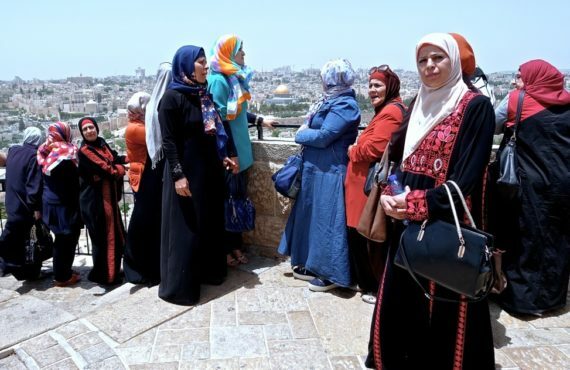 It is spring in Palestine, and so the weather, for us at least, is pretty well perfect, being warm and breezy most of the time. 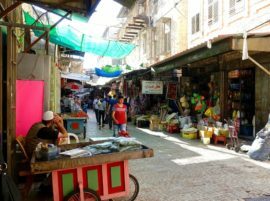 We arrived late in the afternoon and drove straight from the airport to the beautiful and bustling old city of Nablus – with its fabulous, sprawling and colourful souk. It was evening by the time we arrived at the art and literary centre, Hamdi Manco, and set to straightaway, hanging British Council Palestine’s exhibition “Disability Art – the Successes and Challenges”, a showcase of paintings and drawings by disabled and non-disabled people, which had had its first showing in January 2017 at the Red Crescent in Ramallah. We finished work very late that night; but the exhibition was ready for the opening ceremony at noon the next day with a representative from the Ministry of Culture, Eng. 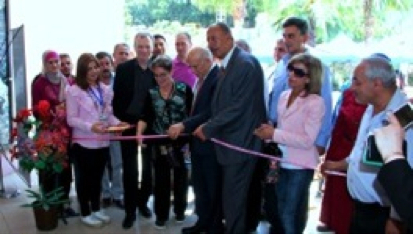 Sameeh Tubaila, recently elected Nablus Mayor, local dignitaries and David Elliott, British Council Director Arts, Middle East & North Africa; and Rachel followed up the opening by conducting an art workshop the next day for approximately thirty adults at the centre, coming from a number of organisations, including the Women’s Study Centre and the Red Crescent, Nablus. Our visit coincided with the penultimate evening event of PalFest 2017 (The Palestinian Literary Festival) which was held in a grand old one-time residence within the city, and to which we had been invited. The panel this evening included both Palestinian and British writers, who read and spoke about their work, considering the theme of imperialism. The festival, which is funded by British Council, celebrates its tenth anniversary this year. As usual throughout all of this we received huge support from our lead project partner, British Council Palestine (Occupied Territories), and British Council Art Program Manager Suha Khuffash, and BC Arts Program Assistant Haneen Tartir. Rachel Gadsden DU LSBU (Hon.) 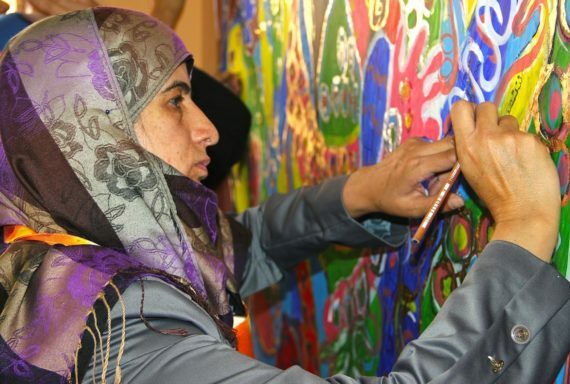 is an artist/director; she spent her childhood and teenage years living in the Middle East. Expressionist in approach, Gadsden creates National and International art projects through, painting, performance, and film, with the objective of creating cross-cultural artistic dialogues that consider profound notions of what it is to be human. 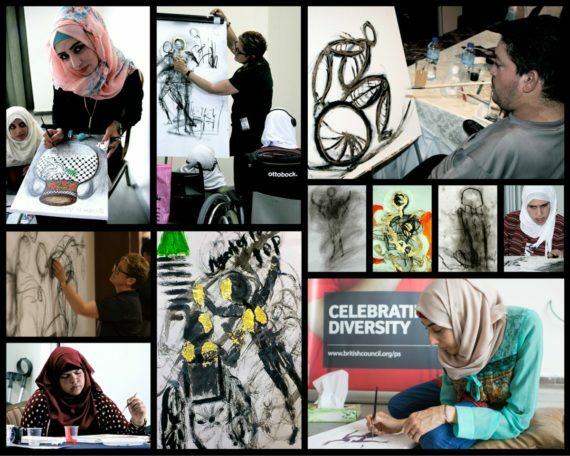 Gadsden currently is focusing on British/Arab projects, engaging vulnerable and disabled individuals and communities in the UK & across the Arab region, to facilitate them to find a creative voice to celebrate identity, culture and the spirit of the Arab World. Gadsden’s acclaimed projects have been exhibited throughout UK and Europe and in Bahrain, Brazil, Oman, Palestine, Qatar and Saudi Arabia and the USA. She is a multi-award winning artist who has a BA and MA in Fine Art; after building a significant reputation for her artworks through exhibitions, residencies and engagement projects, she was appointed the first contemporary artist for Hampton Court Palace 2008 – 2009 for Historic Royal Palaces, and has subsequently undertaken 4 major commissions for UK Parliament (2009 – 2015). 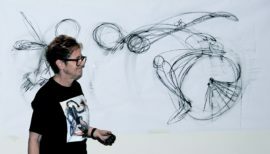 London 2012 Cultural Olympiad commissions followed - Unlimited Global Alchemy and Starting Line. In 2013 Gadsden represented the UK, creating “This Breathing World” for Qatar – UK Year of Culture 2013, for British Council and Qatari Government, HRH Prince Charles formally opened the exhibition. Further 2013 commissions included Talking Souls with BC South Africa & Cube of Curiosity with Marc Brew for Liberty Festival. In 2014 Gadsden created a digital artwork for the Sochi, Winter Paralympic Heritage Torch Lighting. 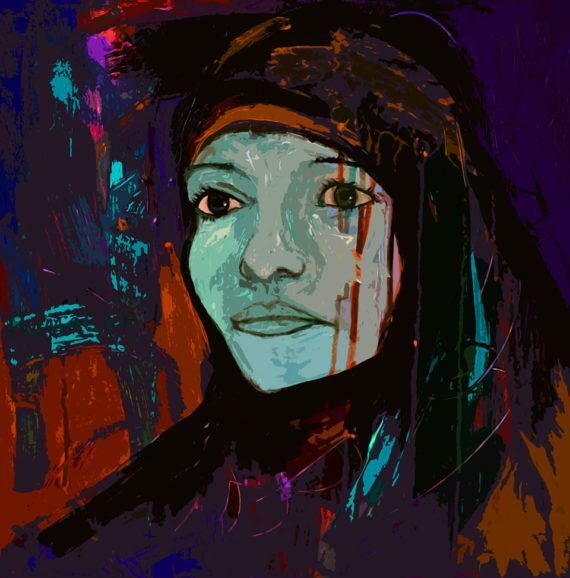 Gadsden also embarked on Al Noor ~ Fragile Vision, a multi-cultural collaborative UK and Middle East project and she completed 14 Stations of the Cross paintings for St Joseph’s Cathedral, Abu Dhabi. 2015 major commissions included The Four Fridas for GDIF, A Tale of Two Cities project in collaboration with Everton and Manchester City Power wheelchair football, “Amandla” for Freewheelers Theatre and Media and ILHAM exhibition and conference at Museum of Islamic Art, Qatar, and 2 artistic delivery residencies for British Council in Bahrain and Palestine. Gadsden was selected to present at the AWID International Forum in Bahia, Brazil 2016 and she was been commissioned to be the lead artist for the 2016 Rio Paralympic Heritage Torch Lighting Ceremony at Stoke Mandeville, UK. Recent Arts Council - Artists International Development Award and an a-n Travel Bursary and an a-n Travel Bursary enabled her to expand and to further develop her work in Palestine with the Bereaved to Bereaved Women’s Group, Jerusalem, with Gaza and West Bank disabled artists and athletes. Gadsden has recently returned from Qatar, having undertaken her first commission for the Supreme Committee for Qatar 2022 Football. Gadsden was awarded the National Diversity Award 2013: Positive Role Model for Disability and she was shortlisted for the European Diversity Awards, Hero of the Year 2014, and she won Breakthrough UK - National Independent Living Award "Influencing disabled people’s participation in society” Gadsden is Patron for 3 Disability Arts Charities in UK, QEII School in Horsham for moderate to severe disabled young people, DASH Disability Arts, a Disability led visual arts organisation, and Freewheelers Theatre Company, a disability led theatre and media company, and Gadsden is also an active Ambassador for Spirit of London 2012 Trust. Gadsden was awarded an Honorary Doctorate from London South Bank University in recognition of her artistic career, in Nov 2016.